Tim usually wants me to write about 500-1000 words for these reviews but you should know, anything I write after the following sentence is irrelevant. YOU SHOULD BUY THIS DVD SIMPLY BECAUSE THE TRIPLE-THREAT MATCH FOR THE WWE WORLD HEAVYWEIGHT CHAMPIONSHIP BETWEEN BROCK LESNAR, SETH ROLLINS AND JOHN CENA IS INCREDIBLE. I’m serious. For that match alone this DVD is worth every penny. January and we already have the match of the year. Despite this, WWE still give us more, with the annual 30 man Royal Rumble spectacular itself – still the most exciting single match on the WWE calendar. Two men start, then every 90 seconds thereafter another person enters the ring. Elimination occurs by throwing a competitor over the top rope and both feet touching the floor. Whoever is left standing after all thirty men have entered and twenty-nine have been eliminated is the winner, and gets a guaranteed title match at Wrestlemania. 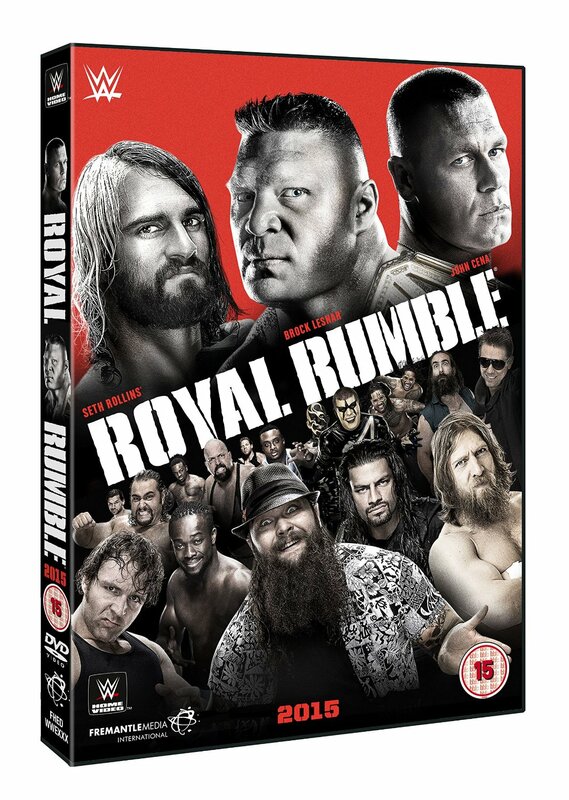 Put simply, there has never been a Royal Rumble match not worth watching, and this one is no different. While the crowd on the night – and those of us watching at home when it first happened – were not pleased with the ultimate result, and were furious at the quick elimination of their favourites, even that displeasure cannot take away the inherent excitement of the Royal Rumble format. From the near-missing teeter-tottering of hopefuls clinging on for dear life, to the now annual Kofi Kingston spot, to the constant second-guessing of who is coming out next and who is going to be in the final four, to the surprise entrants from wrestling past – this year an ECW original, a former WCW champion, and a worm-eating madman, to the stand-out performances – Bray Wyatt wins the honours in 2015, enjoying a “CM Punk moment” with the microphone in between entrants, to the inevitable betrayals when partner eliminates partner, to the controversial endings, the Royal Rumble is a thrill-ride, and 2015’s edition is as good as any other (though definitely let down by the predictable victor).